Neil Sedaka released a new CD entitled "Waking Up is Hard to Do" last week. It's a CD for kids and he apparently rewrote the lycircs for several of his hit songs. For example, Breaking Up Is Hard To Do is now Waking Up Is Hard To Do. OK, so they're his songs and he can do whatever he wants but seriously, this is just so wrong...Lunch Will Keep Us Together! Dude, what were you thinking! I wonder what Captain & Tennille think about this! It's Toni's birthday today. Can you believe that she's 68? For the longest time, she always said that she was born in 1943 but about 15 years ago, I learned from a reliable source (who shall remain nameless, but he wears a captain's hat and sunglasses...hee hee hee) that she was actually born in 1940. About a year ago, she admitted that she was, in fact, born in 1940. She had never felt comfortable lying about her age but the "powers that be" in the record industry had convinced her that it would be best to shave a few years off her actual age. I don't understand the reasoning behind this but then again, I'm not in the record industry. Toni has taken a break from blogging while they finish construction on their new house. You can read her past blog entries by clicking here. Be sure to check out her post dated February 9. She had asked fans to e-mail her telling her who we support in the primaries. Guess who the one vote for Mitt Romney was from? Hee hee hee...You will also notice that she mentioned that one reader called those who disagree with her views "ignorant" but no, that was not me. True C&T fans know exactly who it was. This particular person tends to surface, make waves and then disappear for a while only to repeat the process again and again. OK, probably more than you ever wanted or needed to know. By the way Toni, I forgive you for voting for Hillary in the primary...hee hee hee. It's Daryl Dragon's 65th birthday today. For those of you who are too young to remember the 70's, he the Captain of Captain & Tennille. Woohoo. I pre-ordered the Captain & Tennille DVD's that will be released on September 3. There is a box set which contains the New Orleans Special, Hawaii Special and Songbook Special and a separate DVD of their Christmas show. I ordered the box set and each special individually along with the Christmas show. I can't wait to see them again. I do have the three specials on VHS but the quality isn't very good as they were recorded back in the late 70's. About a year and a half ago, Captain & Tennille released a box set containing 9 hours of their TV show from 1976-1977. As you can guess, I have watched the DVD's many times and, believe it or not, I actually remember most of the skits and songs even though I only saw each show once as they never went into reruns. These new DVD's are available for pre-order at Nulime.com. They will be available in 1 month, 2 weeks and 3 days and I'll be counting the days The countdown has begun...hee hee hee. I'm one happy Captain & Tennille fan! Quite a while ago, I mentioned that I have a Captain & Tennille stamp and that I was working on a card. I finished the card and wasn't happy with it so I set it aside. I ended up totally scrapping it and starting over. I looked back through my blog to see when I made the first card and it was almost a year ago! Yikes. Time sure does fly. Anyway, you can read my original post here. Here's my second attempt. Card stock and ink are @Stampin' Up. I bought the paper at Joanne's and have no idea who makes it. When I saw it, it just reminded me of the 70's. I layered a piece of the paper onto Mellow Moss card stock. I then cut out a small circle of the paper, layered it on a larger circle of Mellow Moss and then mounted it in the lower left corner. I stamped Captain & Tennille in Ballet Blue and then cut out the image and mounted it on dimensionals at the top of the card. 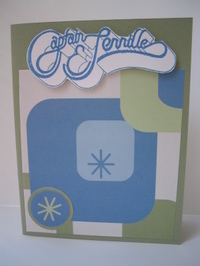 As I said in my post almost a year ago, I have no idea why I need a Captain & Tennille card but it was fun to make.